Entry open next week for the third annual PExpo which will take place in Trinity Comprehensive Ballymun, Dublin, on Wednesday March 8, 2017. 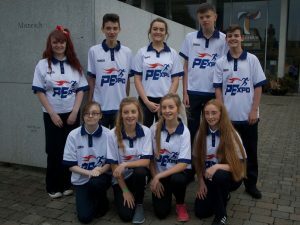 The purpose of PExpo is to encourage young people not only to take part in sport but to undertake research into different aspects of sport, fitness and physical activity. Students in junior (1st,2nd,3rd year) and senior (TY, 5th, 6th year) age groups are invited to submit projects examining aspects of physical education in five categories. Prizes go to the best projects in each category in both age groups, with the top prize along with a bursary going to the overall winner. Last year, over 1,000 students attended the expo with 150 projects entered. Many more are expected this time and over the past few weeks, all 750 secondary schools in the country have received a letter inviting them to submit projects for PExpo ’17. 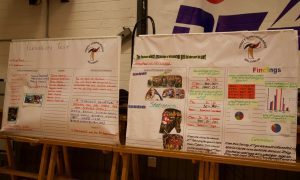 Categories for projects include Games Development, Health Promotion and Physical Activity, ICT and Photography, Nutrition, and Psychology in Sport. Among the winners last year were Aisling Bardsley, Ellen Stafford and Laura Stafford of Colaiste Muire Cobh who have designed the new website. Earlier this year, the talented trio the “Best IT Project” at PExpo ’16 for their website “Chillax Teens” which shows how a healthy diet and physical exercise can decrease stress, depression and anxiety in teenagers.In recognition of their IT skills, the girls were asked to design the PExpo website for the coming year. Supporting the PExpo are the Physical Education Association of Ireland, Dublin City Council, Trinity College Sports, Celtic Sports Academy, DCU and Independent Newspapers. Professor Niall Moyna of DCU’s sports science department will lead the panel of judges. For entry forms and further information on PExpo ’17, see www.pexpoireland.com. Or contact Paddy O’Reilly at 0861743836 or peexpo1@gmail.com. Tulu, Johannes win Dublin Marathon. Monahan clocks 1:39. Ciobanu, Graham take national titles. Results round-up.